As mentioned, the Pharos Mercury talismans are available! It's your chance to get something that will counter those nasty Mercury Retrograde effects that plague us three times a year. Getting the pics of these talismans was difficult, I suspect in part due to their mercurial nature, and the Rx didn't help. They are beautiful in real life. Pharos is also going to be creating the silken cloth wrap suggested by the Key of Solomon for each person that buys one, but the silk won't be ready to ship until after July 1. You'll get the talismans first, though, along with a "Working with the Key of Solomon Talismans" guide I'm writing, an expanded version of the methods of operation I posted with the Venus talismans. We have six talismans available. All were made on good elections, and finding a good election for the planetary hour and planetary day that line up with the instructions from the Key of Solomon isn't easy. We won't be able to make things with additional astrological graces like this until next year, for the Mercury talismans. 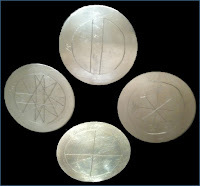 Four of them are on 2" silver disks, and were created when Mercury was direct, and dignified by sign and term (Pharos says they score a +7 for the election, if I understand right). Two of them are on disks measuring 1 7/8" across, and were made when Mercury was direct, and dignified by sign and face (Pharos says they score a +6 for this election, again, assuming I understand right). Please don't ask me what that means. Pharos is the brains when it comes to the astrological values. All I know for sure is that these talismans have the regular value of being made in the appropriate hour of the appropriate day by the Key of Solomon, plus the added virtue of being made at beneficial election times. What this means is that they will be more effective in your use of them for Mercurial manifestations. This is the Second Pentacle of Mercury, which will "serve to bring to effect and to grant things which are contrary unto the order of Nature; and which are not contained under any other head." We have one on a 1 7/8" disc with a +6 election that costs $325. We have another on a 2" disc with a +7 election that costs $375. I really wanted to keep one of these for myself, but I can make them myself, and the main reason I sell these things is so that people who aren't comfortable making them themselves can benefit from the results, so ... sigh. The things I do for you people. The "Key to the Universe"
This is the Fourth Pentacle of Mercury, which is "proper to acquire the understanding and knowledge of all things created, and to seek out and penetrate into hidden things; and to command those spirits which are called Allatori to perform embassies." We have only one, on a 2" silver disc with a +7 election. This talisman is extremely potent without the election, and is something every magician should have in their repertoire in my humble opinion. I mean, come on, you get to know ALL THINGS CREATED. Why we don't sell more of these at the regular price is beyond me. The spirits of this pentacle are adept at revealing information sources, providing insights, and making the kinds of connections that lead to the AHA! moments that make this magic stuff so fun and useful. This talisman is priced at $525. This is the Fifth Pentacle of Mercury, which "serveth to open doors in whatever way they may be closed, and nothing it may encounter can resist it." This talisman seems to be used by a lot of my clients to "open" relationship opportunities with people who are, for whatever reason, unwilling to start a new relationship with the client. It's also incredibly useful with cases in probate, for some reason. Any situation that's stuck falls before its influence, in my experience. We have three of these available, one on a 1 7/8" silver disc with a +6 election that costs $325. We have another two on a 2" disc with a +7 election that costs $375. Each talisman includes the silk cloth recommended by the Key of Solomon, which will be available after July 1, and the "Working with the Key of Solomon Pentacles" guide I'm writing. Talismans will be shipped separately from the silk cloths due to the delay in getting them produced. Please select the talisman of your choice from the drop-down below, and again, if you try to buy it and it's already sold, you'll be taken to a "sold out" page, and you'll have to re-evaluate your selections.